Please note that all voucher sales are FINAL and no refunds will be given even if you purchase a voucher by mistake, or if the client doesn’t want it anymore. There will NOT be any refunds under ANY circumstances, no exceptions will be made. This page allows you to select the Carrier you want to purchase. This page allows you to select the quantity and price of the voucher you want to purchase. This page allows you to see the status of your order and ask for assistance if necessary. This page allows you to claim your voucher and view all your recent voucher transactions. 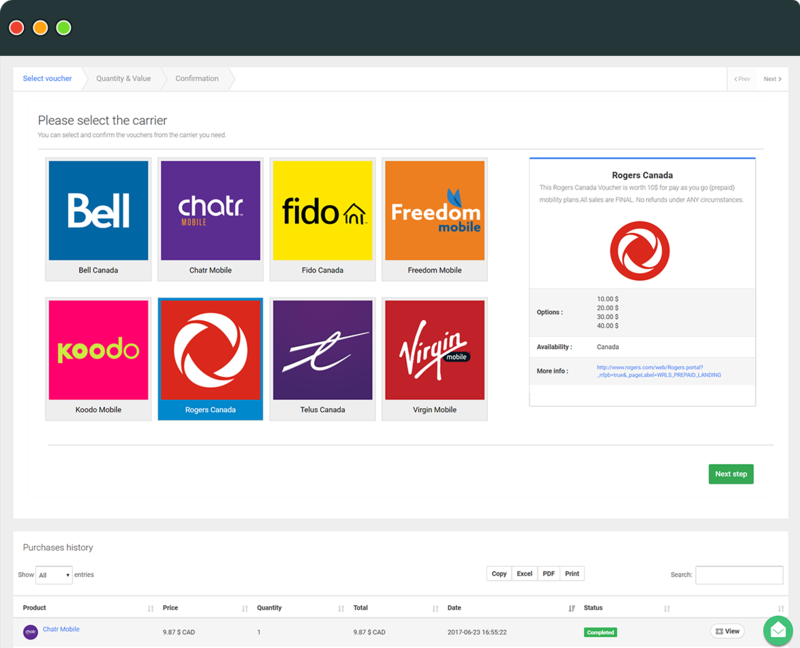 First you can navigate to the section called Prepaid Vouchers, from there you have access to all the Canadian carriers. These top-up prepaid cards are used by customers who use prepaid plans with their carriers. From there, you can select the carrier that you need and have an overview of the available options for you to purchase for your client. Once you have chosen the company you need, you can select the value as requested per your client, select the quantity and then click “confirm your order”. From there you can also see the price you pay, you can charge customers the amount you want through your own invoicing system. Important : It can happen sometimes (very rarely) that we are out of stock on some vouchers, in this case, the sale will proceed but the status will change to “pending”. If you ever encounter this issue, please contact us directly through Live Chat and an agent will be able to assist you. Once you confirmed the order, you will see your purchase confirmation, you have the option to “view voucher” and “print voucher”, if you want to print it and give it to your client. Note : it will say “Powered by YOUR STORE NAME” and not powered by Unlockr You can also view your transaction history at the bottom if ever you need to access older vouchers.